With the PetSafe PIF00-12917 Stay & Play Wireless Fence you will no longer have to worry about investing in an expensive fence or burying wires all over your yard to keep your pet safe. Instead you will have a convenient and comfortable way to teach your furry little friend how to stay within certain boundaries. The PetSafe PIF00-12917 Stay & Play Wireless Fence is a sleek in home unit that gives you the ability to enclose a specified circular area using an electronic signal. The circular area is adjustable and can be easily changed at your discretion. The unit can cover a maximum of 210 feet in diameter and a minimum of 44 feet in radius. Anytime your pet goes outside the specified area he or she will receive a static correction. With 5 adjustable levels of static correction you are in complete control of how much correction your dog receives. For the safety of your dog there is an automatic safety shut off feature. After 15 seconds the correction will automatically stop. There is also a tone only mode that will alert your pet with a beep. The PetSafe PIF00-12917 Stay & Play Wireless Fence is a completely wireless system that can be set up in 2 hours or less. It is also portable and can be plugged into just about any outlet. That means whether you are at home or on vacation, you can have the peace of mind knowing your pet will always have a safe space to roam around in. You can easily expand the size of the play area by connecting additional wireless transmitters to the unit. Have multiple pets? No problem. The system is able to handle an unlimited number of pets through additional wireless receiver collars. The receiver collars are waterproof and rechargeable. The built in battery is non replaceable and can fully charge in 3 hours or less. 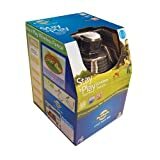 The PetSafe PIF00-12917 Stay & Play Wireless Fence is the newer better version of the original Wireless Pet Containment System. The transmitter is now 67% smaller making it a lot easier to fit in various locations. The collar has also been redesigned and is smaller, lighter and able to fit on customized straps. The kit comes with an operating guide, a training guide, 2 long contact points, a test light tool, 50 boundary flags for training, a contact point wrench, a receiver collar with a rechargeable battery, and a wireless transmitter with a power adapter. ➔ Can accommodate dogs 5 pounds and up. ➔ Waterproof collars making it ideal for various weather conditions. ➔ The collar has a built in rechargeable battery so there will be no need to buy new batteries. ➔ Easy setup. Can usually be ready to go in less than 2 hours. ➔ Training guide included which makes it easy to get your dog acquainted with their new boundaries. ➔ Completely wireless and portable meaning it can easily be moved and taken to other locations. ➔ 5 adjustable levels of static correction. ➔ Tone only mode for those who would prefer not to use static correction. ➔ Lightweight collar so your dog won’t weighed down. ➔ Covers an adjustable circular area of up to 210 feet in diameter. ➔ Containment size can easily be expanded with additional wireless transmitters. ➔ Comes with a three year warranty. ➔ Things such as a metal roof can interfere with the signal and cause the unit to malfunction. ➔ The collar may give out static signals even when the dog is within the containment area. ➔ Some users have complained the system is not durable. Some have reported the system stopped working after only a few months.